Engaging questions ranging from motor racing to Trainspotting. 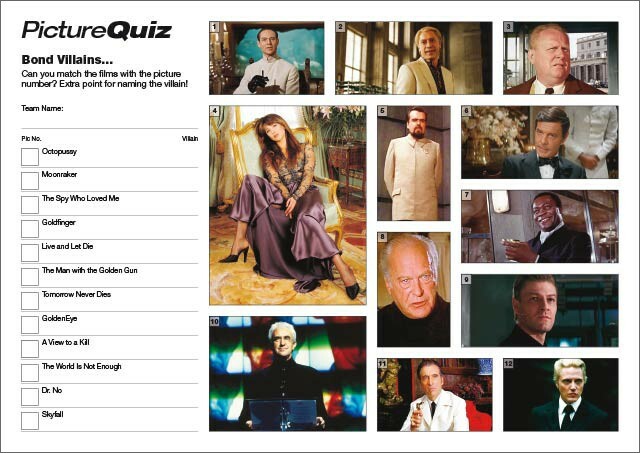 The Picture Round is on Bond Villains and the Wild Card is a tricky statistic about the undisputed Queen of Pop, Madge. Q08. The computer programmes Illustrator, Photoshop and InDesign are made by which software giant? Q17. Which band’s 2002 greatest hits album is entitled Forever Delayed? Q29. In the 1990s who became the only son of a former F1 Motor Racing world champion to also win the title? Q38. Who played the psychotic hardman Francis Begbie in the 1996 film Trainspotting? The Wild Card for Quiz 018 is a tricky statistic about the undisputed Queen of pop, Madge and her singles performance.